Smoothens the texture of your skin. 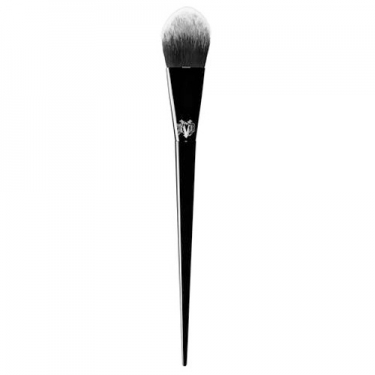 DESCRIPTION: Lock-It Precision Powder Brush from Kat Von D is a premium quality powder brush with a unique arched shape, specially designed for setting under brooder to the eye. This brush features a unique design for unprecedented control. The rounded silhouette and flat profile provide precise angles and edges to focus the product exactly where it is desired, in areas that other brushes can not reach. Designed with soft, high-quality synthetic bristles, this brush is ideal for use with the Lock-It Setting Powder to set concealer down the eye. It can also be paired with your favourite marker for precision strobing. The stylish and styled handle was inspired by a witch's broom, with soft and sturdy acrylic grips weighted for ergonomic grip and ultimate control.